This is Visionaire #58, Spirit. A Tribute to Lee Alexander McQueen. The outer case is wrapped in embroidery used in McQueen's SS 2010 collection. So beautiful. I don't have to open it to understand the value of this issue. The above lryics, sung by Lady Gaga, play each time Spirit is opened. The editors of Visionaire, Cecilia Dean, Stephen Gan and James Kaliardos, made the issue even more exceptional by mixing wildflower seeds in the pulp used to create the paper to print Spirit. Will I grow my own page? Yes. It is an honor to own Spirit. 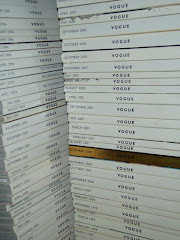 Magazines are what I turn to in times of tribute, celebration or memento. And although I would also be honored to own a closet full of McQueens creations, Spirit mirrors my emotions regarding the public life of McQueen I was exposed to these past 14 years. His shows may have stir up commotion, but his clothes inspired stillness, just simply because they took my breath away. i really shouldve "gone freelance" after buying this. haha. the lady gaga singing bit is kind of a bummer though, does she need to be so prominent everywhere when shes only been around two years? BUT i still want this so so bad. its beautiful. i stumble around words trying to explain how much i love it. i knew you would get it. i do wish they used bjork. that would have been just amazing. visionire is and will always be my holy grail. I actually got shivers seeing just a blog post about this, I can only imagine how it must be in person. I have to say that this is such a beautiful blog...what you stated is so true. thank you for appreciated magazines and fine print. it is sad that many people don't appreciate things like that. on a sidenote, i am curious what is your favorite mcqueen collection? he took 'the shinning' and made into something i wanted to wear! who does that anymore?? i would wear every piece of that collection for years. thank you for your comments, girls! i am inspired by your blog every morning. the images you share are beautiful!